"Bravo, Piccioli. This was outstanding." 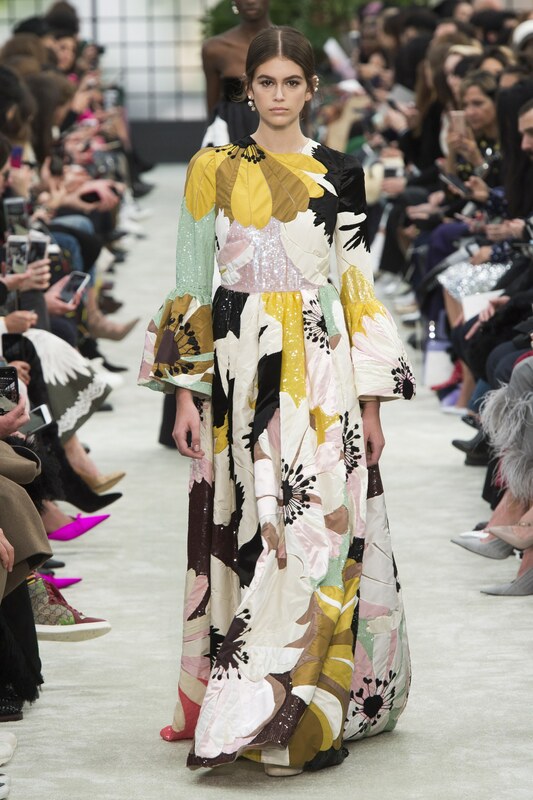 The last line of Sarah Mower's review of the Fall/Winter 2018 Valentino collection said it all, really: Pierpaolo Piccioli's latest outing put forward a rich vision of today's Valentino woman, a vision as notable for its expansiveness as it was for its imaginativeness and sophistication. 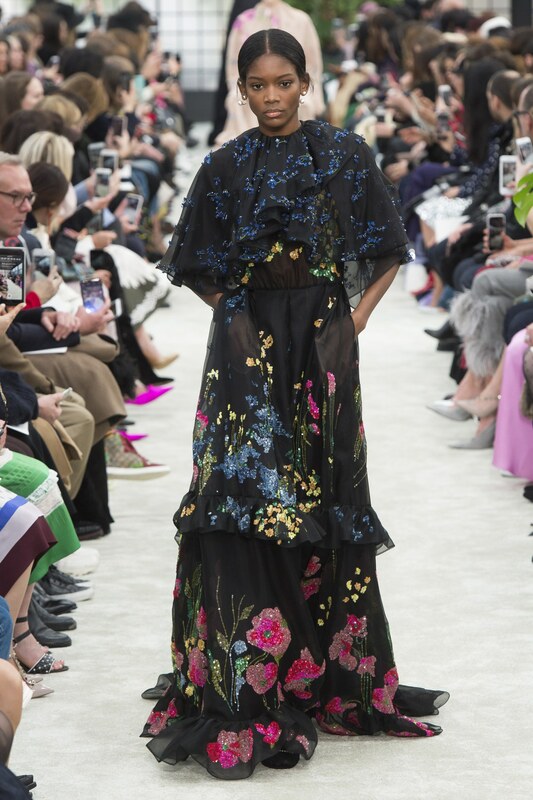 Like many designers this season, Piccioli seemed to be contending with the meaning of the #metoo moment and how it relates to fashion; the brilliance of his response was in the way he leaned into conventional totems of femininity, such as floral decoration and flowing lines, and offered them as a signals of strength. The women on this runway looked powerful. They also looked womanly. As ever, Piccioli sought inspiration in the Valentino archive. 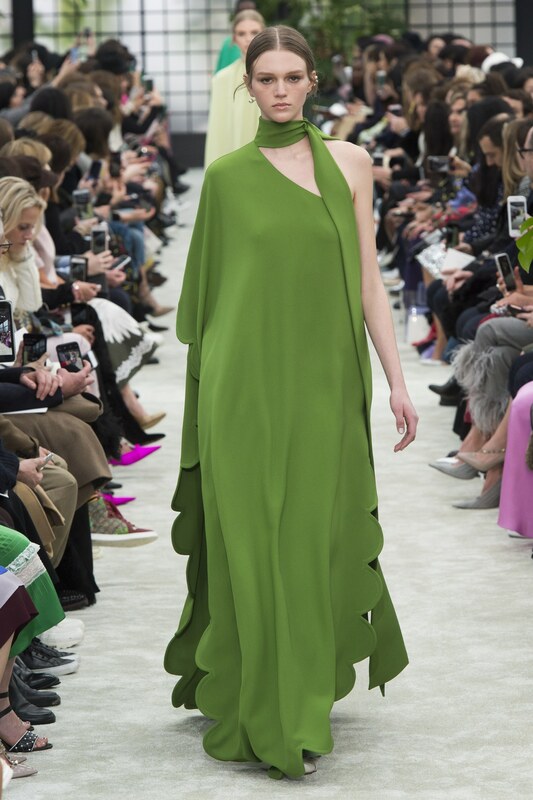 Numerous looks here were reinterpretations of Valentino classics, to wit the one-shouldered gown in grass green that echoed the mint-green gown famously worn by Jacqueline Onassis on a visit to Cambodia in 1967, or the tiered pink gown, with scalloped edging, that winked at the extraordinary, rosette-embellished frock from the Valentino Haute Couture Spring/Summer 2008 collection. 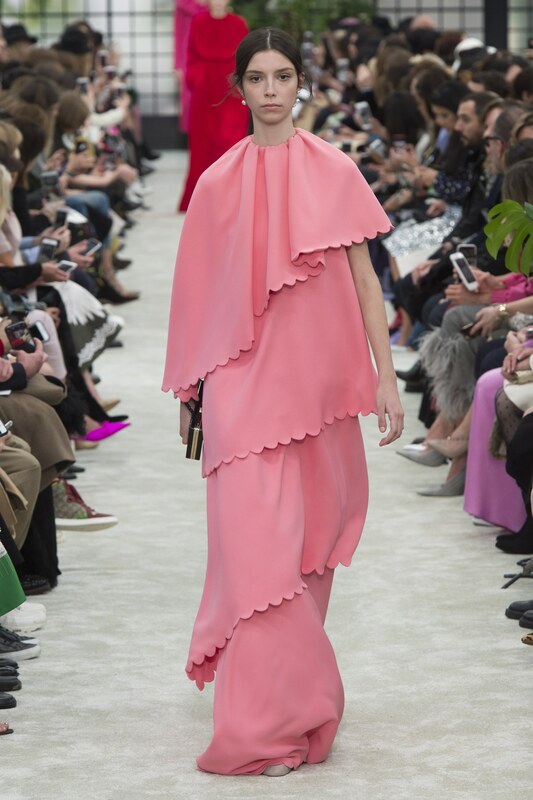 The newness was in Piccioli's method of stripping the vintage piece down to its essence—for the green gown, the one-shouldered drape; for the pink, the confection of tiers—and super-saturating the palette. The looks he created were romantic, in the signature Valentino style, but they were not coy. Piccioli also continues to astonish in his ability to match his peerless Valentino gowns—the category the maison is best known for—with elegant yet accessibly contemporary ensembles for day. Working with bold color and pattern, and fusing the hard lines of his precisely proportioned tailoring with dramatic volume and gestures of softness, he conjured up an image of forceful femininity. We are women, this collection pronounced, in a firm yet measured tone. Hear us roar.